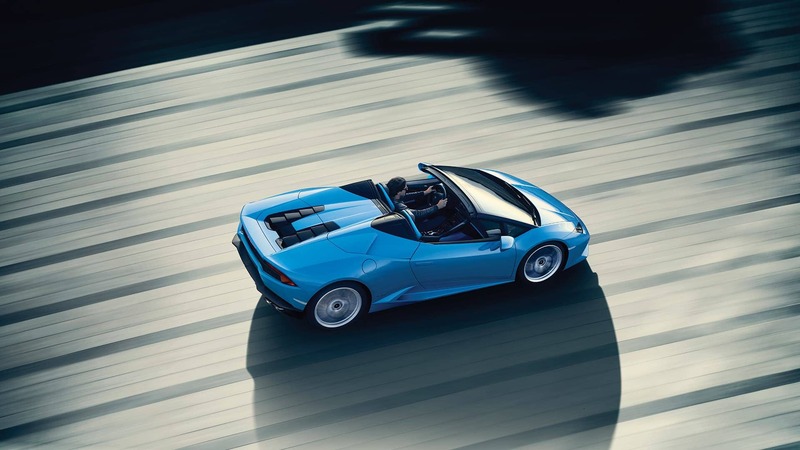 Image showing a Lamborghini Huracán Spyder as seen from above with a man driving. The car drives against a gray-metallic background. Cropped image showing the front of a white Lamborghini Huracán Spyder, parked beside a road. The image shows a portion of the rear profile of a blue Lamborghini Huracán Spyder parked, the Sydney Opera House in the background. Interior image of a Lamborghini Huracán Spyder with details of the headrest with Lamborghini logo embroidered in blue. Front three-quarter view of a white Lamborghini Huracán Spyder parked before a graffiti-covered wall. The picture shows the front profile of a blue Huracán Spyder parked by the sea, a cityscape in the background. Cropped detail of the front headlight of a blue Lamborghini Huracán Spyder. Close-up of a spool of thread beside colored hides. Cropped side view of the front of a grey Lamborghini Huracán Spyder. Cropped close-up of a steering wheel shot from the side.